Mary A. Simbol, 95, of Terre Haute, Indiana fell asleep in the Lord on Saturday Aug. 1, 2009 at 5:27 p.m. in Regional Hospital with her loving children and grandchildren by her side. She was a retired farmer. Mary was born Sept. 5, 1913 in Spring Valley, Ill. to Julia and Mose Malooley. Her husband of 63 years, Mike Simbol, had passed away in April 2003. Mary is survived by her children, Nora, Mike, Esther, Nellie and Mary Ann Simbol; and grandchildren, Curtis S. Bodine and wife Kelly, and Michelle, Mike, Nicholas and husband James; and by great-grandchildren, Luke, Isaac, Nicholas and Maya Simbol Bodine. She is also survived by her sisters, Louise Grohovsky and Julia Winniski, sister-in-law, Rose Malooley and many nieces, nephews, and cousins, all of whom she loved like her own children. She spent her childhood in Kearney, Nebraska, where at age 16 her mother passed away 10 days after childbirth. Being the oldest of six children, she cared for her younger brothers and sisters. In 1929, her father moved the family to Terre Haute, where they continued their farming profession. Metropolitan ILYAS (Kurban) Archbishop of Tripoli and al-Koura (i.e. 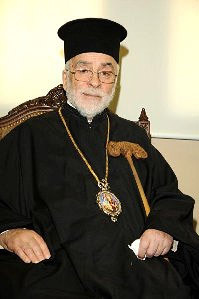 "the countryside"), former proistamenos at St. George Church in Boston and the senior-most member of the Holy Synod of Antioch (having served as a Metropolitan from 1962 until the present), fell asleep in Christ on Thursday, July 30th, 2009. Sayyidna ILYAS was affectionately known as "The Nightingale of Antioch" because of the beauty and compunctionate character of his chanting (click here for video). May his memory be eternal! Update: His Eminence Metropolitan PHILIP has written and sends this loving obituary of the man about whom he writes "the echo of his voice will remain in the ears of the present Orthodox generation, and in many generations to come. His memory indeed is eternal!" More photos of Metropolitan ILYAS may be found here. Metropolitan ILYAS (Kurban) was born in Ain-Sindyaneh in the late 1920’s. He lost his father when he was a child. He and his brothers and sisters were raised by his late mother of blessed memory. He began his life in the Church at a very early age at Saint Elias Monastery of Showaia and subsequently he enrolled at the Balamand Seminary near Tripoli, Lebanon. He was gifted with an angelic voice and excelled in Byzantine Music. After he left Balamand Seminary, he enrolled at the Asiya Orthodox School in Damascus where he received his Baccalaureate Degree. From Damascus he came to Beirut to live at the Orthodox Bishopric under the Omophorion of the late Metropolitan ELIA (Saleeby). 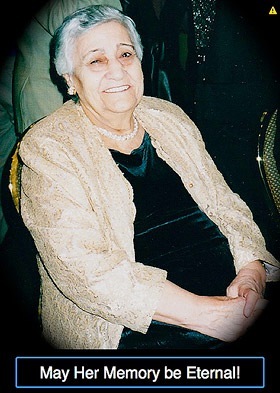 Mrs. Nazik Farha Rashid, the eldest sister of the Vice Chair of our Archdiocesan Board of Trustees Dr. George J. Farha of St. George Cathedral/Wichita, KS, has reposed in Beirut, Lebanon at the age of 95. Archpriest James Kenna, 74, of St. Sophia in Dripping Springs, TX, was fatally injured in an automobile accident on Sunday, July 26th 2009. Services for Fr. James will be held at St. Sophia on Tuesday July 28 and Wednesday July 29th; see below for further details, or visit St. Sophia's web site. Condolences may be sent to Khouriya Anne and the Kenna family c/o the Dean of Central Texas, Fr. David Barr of St. Elias Church in Austin, TX, at stelias_austin@sbcglobal.net. The Rev. James Kenna was an energetic Dripping Springs pastor who founded several Orthodox Christian parishes in Central Texas and, even in retirement, was looking to establish more. "He never wanted to quit," said the Rev. 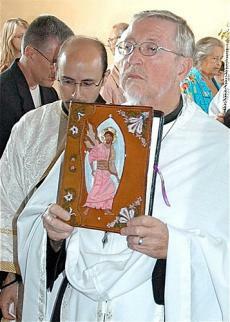 David Barr, the pastor of St. Elias Orthodox Church in Austin. Kenna, 74, died Sunday afternoon in a car wreck on his way home from lunch with a parishioner after attending church in Dripping Springs. Austin police officials said Kenna's PT Cruiser left Texas 45 for an unknown reason, crashed into a fence and flipped over into a retention pond. blessed memory. The funeral for Kh. Leonida Reinhold was scheduled for Tuesday, June 23 at 7 PM at St. Michael Church in Van Nuys, California, and the graveside was scheduled for Wednesday morning, June 24. Very Rev. Fr. Paul Moses + Memory Eternal! of Melbourne, FL has prepared this remembrance. Roujina (Koury) Ilyas + Memory Eternal! Roujina (Koury) Ilyas of Munhall, Pennsylvania fell asleep in the Lord on May 16, 2009 at the age of 95 at the National Naval Medical Center in Bethesda, MD. She was the beloved wife of the late Dr. Shakir T. Ilyas; loving mother of Thelma Badwey (Dr. Robert Badwey) of Potomac, MD and Thomasine Alvarez (CDR Everett Alvarez, Jr. USN, Retired); grandmother of five adoring grandchildren; Dr. Robert Badwey, Richard Badwey (Laurie), Rayna Matz, Marc I. Alvarez Esq. (fiance Jennifer), and Lt. Bryan Alvarez M.C. USN (Jade). She was also survived by four loving great-grandchildren. The family will receive friends on Tuesday, May 19, 2009 from 2-4 and 7-9 p.m. at the SAVOLSKIS- WASIK-GLENN FUNERAL HOME, INC., 3501 Main St., Munhall, PA 15120. A funeral Liturgy was held on Wednesday, May 20, 2009 at St. George Cathedral in Pittsburgh. In lieu of flowers, the family suggests memorial contributions may be made in memory of Mrs. Ilyas to St. George Antiochian Orthodox Cathedral, 3400 Dawson St., Pittsburgh, PA 15213. Khanum Yacoub + Memory Eternal! Khanum Yacoub, 72, of Terre Haute, Fell Asleep in the Lord unexpectedly on Sunday, April 19, 2009. She was born in 1937, in Syria, to Daoud Yacoub and Sara Sharo. Her husband had Fallen Asleep in the Lord 40 years ago on the Feast of the Nativity and she was left with six young children and a farm. Through constant prayer and determination that only the Lord could provide, she managed to run the family farm, raise her children and make sure that each and every child had the opportunity for higher education. With a profound love for the services she would attend as many as her health would allow. The few times when her health stopped her from coming, her prayers for the salvation of the world, and then for her community and her relatives and then finally for her own family (but never for herself) would be said repeatedly and faithfully. Thanks be to God as she was able to attend the Paschal Services and proclaim "Al-Maseeha Kam!" 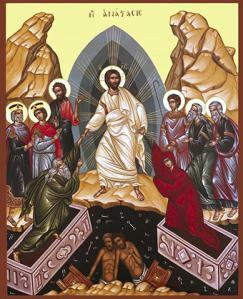 and all who know her realize that this was no mere "twist of fate" that Pascha was the day for her leave this earthly life. Margaret Lois Salaris + Memory Eternal! 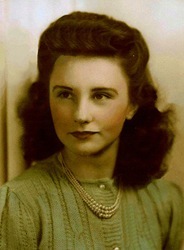 Margaret Lois Salaris was born March 16, 1924 to Ivan D. and Emma L. Crain in Connellsville, PA. After graduating from high school in 1942, she met and married Chris Salaris in Gary, IN. She was a homemaker and raised three children. In 1970, the family moved to Granby, CO and eventually returned to IN in 1989. She was active in church choirs all her life and also sang with the U.S. Steel Chorus and traveled with their “Swing Vochestra” throughout the state of IN. She volunteered at St. Vincent’s Hospital for fourteen years with the Senior Partner Program until 2003. She was a member of Holy Trinity Greek Orthodox Church and sang with their choir for several years. Her husband, Chris, and daughter, Christine, preceded her in death. Surviving is her oldest son, Brian, of Bozeman, MT; her youngest son, Rev. Dr. Steven C. Salaris and his wife Sheryl and their daughter, Tegan, of St. Louis, MO. Viewing will be Friday, April 24th at 10:00 a.m. and funeral following at 11:00 a.m. Both the viewing and the funeral will be held at Holy Trinity Greek Orthodox Church, 3500 W. 106th St., Carmel, IN 46032-5513. Burial with graveside service will be Saturday, April 25th, at 10:00 a.m. at Ridgelawn Cemetary in Gary, IN. In lieu of flowers, memorial donations may be made to Holy Trinity Greek Orthodox Church (address above).